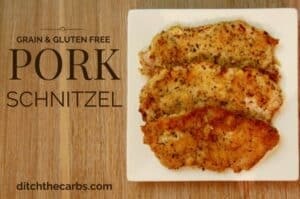 I was incredibly honoured to be invited to write a guest post for Dr Andreas Eenfeldt, aka Diet Doctor regarding low carb kids. For those of you who have been low carb for some time, you will know Dr Andreas Eenfeldt is one of the leading authorities on LCHF science and lifestyle. For my full article, click here to be directed to the Diet Doctor website. I encourage you to read his well-researched articles, especially LCHF for beginners and how to eat LCHF. If you are new here, read this page and this page to help you get started. 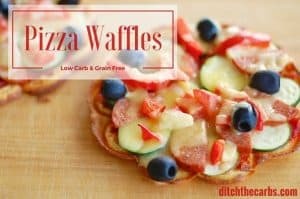 More articles in my series for low carb kids. I designed these graphics for my article as a simple visual teaching aid. 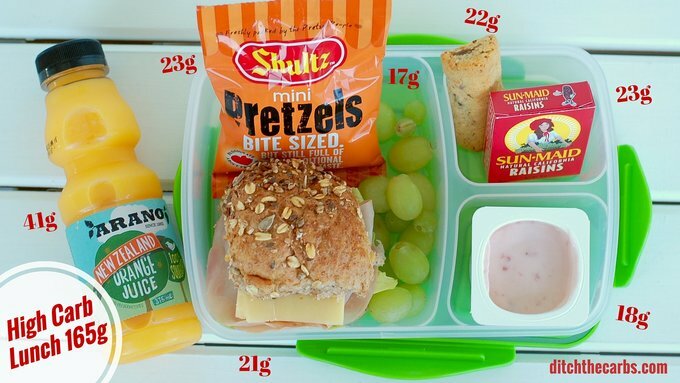 Many are surprised to see just how much sugar and carbs are packed into a school lunch box. Either of these lunch boxes aren’t extreme. 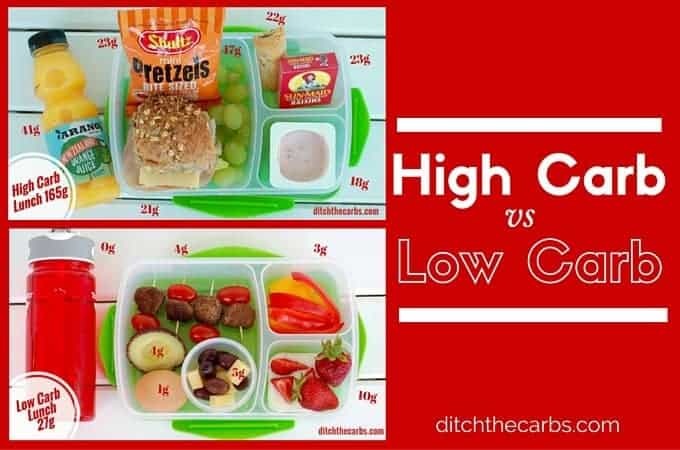 The high carb lunchbox could have been much worse, and the low carb lunch box could have been made even lower if a child needed to have their carbs restricted further for various reasons. 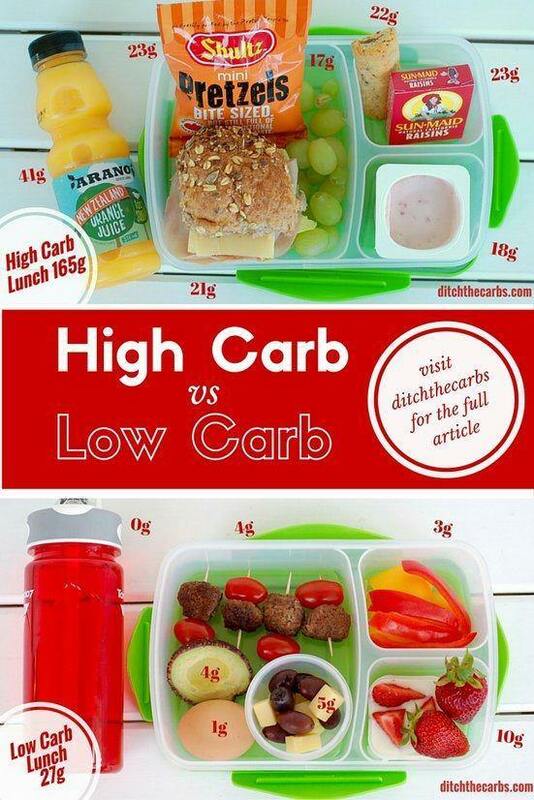 I’m not suggesting the high carb lunchbox is something you might serve your child all at once (yet it isn’t an extreme example). Many lunch boxes often contain chocolate cake, fruit squeeze tubes, Nutella, and jam sandwiches. Then there are the birthday cakes and chocolate bars brought in on a classmate’s birthday. 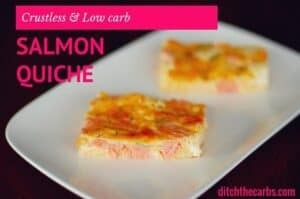 The low carb lunchbox is an example of what can be made quite simply for a nutritious low carb lunch box. It doesn’t have to be complicated, in fact, it’s quite easy. You can see where the biggest source or carbs and sugar were coming from – the juice and the processed food. 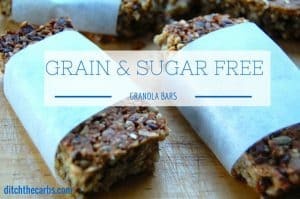 Simply by being aware of these and reading labels will set you on a path to a more nutritious lunch box, and help your child stop the sugar roller coaster. Read the full article for 14 tips and tricks on how to get started. Use slices or cold meat or lettuce instead of wraps and fill with cheese, salad and dips. 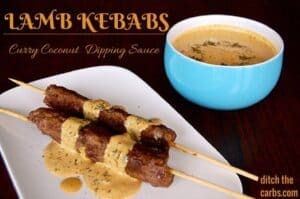 Cut vegetables into different shapes and sizes, serve with a variety of dips, have some low carb baking at hand, fill your freezer, leftovers are KING! What was the biggest eye-opener when looking at these photo’s or reading labels? How have you managed to help your child eat a more nutritious lunch? Share your best tip or trick to help their transition for your family. 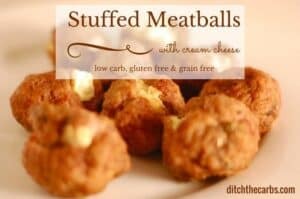 Here are a few great low carb real food lunch box fillers. Leftovers are KING! Try to make double or triple dinners and you’ll be prepared fro the next few days. Load up your freezer. 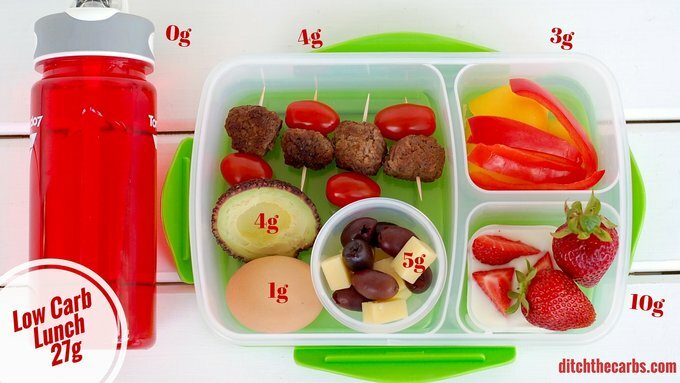 I love this idea & want to implement more low carb lunch options with my 1st grader. However, at 7, she’s not going to eat 1/2 an avocado, meatball & tomato skewer, etc at the lunch table. I’ll read some more of your posts but are there some more realistic options? Sure thing! 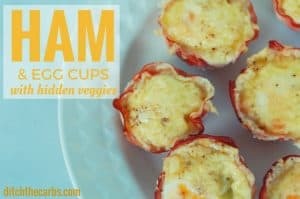 Head over to my Low-Carb Lunchbox Hacks group where I post the lunch boxes I pack form y 3 children (and husband) every day. You can see real life examples. My kiddos are 10, 14, 16 but they actually started at 6, 10 and 12 so have been doing this for some time. Make baby changes one at a time. I am raising a boy for the past two years, he was was being raised by a diabetic grandmother who loved to bake sweets and she died with diabetes, heart issues, and other health problems. His mother and grandfather are also diabetics. He was overweight when he came to me and slowly am helping him change his diet…we watched That Sugar Film a few weeks ago and he got a lot from it. This school year I am making his lunches and sending them with him instead of buying school lunches, which are loaded with carbs and processed foods. 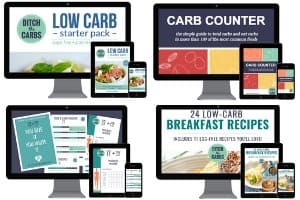 He has lost 15 pounds since March on a lower carb diet and learning to like healthier foods. For other parents who want to send lunches there is a new type of lunch bag that has freezable gel built in, you can pop it into the freezer overnight and put the lunch in to keep it cold assuring nothing gets warm. That was one of my concerns before when I was buying his meals at school. I bought the bag at Walmart, not sure if other stores sell them yet. Patti this is a lovely and moving story. That Sugar Film is superb for getting the message through to children and adults alike. I am so happy he is on board and it is working for him and he is clearly seeing results. He will have a happy healthy future ahead of him. Well done to both of you 🙂 And thanks for the tips on lunch boxes. Hello. Can you tell me how many carbs a teen should have? I have a 17 and 14 year old. Both athletic and very active but they can not seem to lose weight. 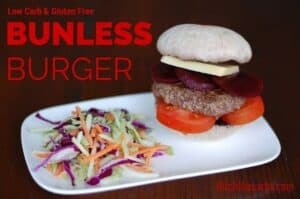 So my daughter (10 years old) is fine with a low carb lunch but my son (9 years old) is struggling with a low carb lunch being un-cool and frequently comes home with lunch completely uneaten. Does anyone have any tips? Inuits, the people who live in the north, have diets very very low in carbs. They mostly eat fat, blubber, and protein. Carby food just doesn’t exist up north naturally. They may eat some grasses and berries in the short summer, but that’s it. Their kids grow up just fine. There’s no grocery store to go to and buy junk. Humans do not need carbs. Even kids humans. Indigenous diets are always healthier no matter what culture or climate, Pacific Islanders, for example were much leaner and healthier until processed imported foods became readily available and sold in local stores. Agree with you, Libby. Giving a kid cheese, fruit, veggies, and a protein gives them all they need. NO one needs processed food which is high in sugar (and therefore carbs) to be healthy and learn. It IS sustainable people!! BEWARE! Children’s brains need carbs. Really. Carbs help brains develop and function properly. Just stick to whole grains and veggies. Keep away from white flour and excess sugar. 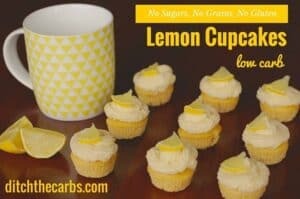 Not all carbs are bad! Can you give me th references to peer reviewed research that confirms this view? Thanks for good suggestions. I originally read your article on DietDoctor. I’ve been eating LCHF for over 2 years but my kids are eating only part of what I eat plus starches and sugar. We’ve been trying to limit the amount of sugar they eat, but it’s really hard when you live with grandparents who believe that kids NEED sugar. Thanks. I asked them to limit sweets to occasionally and I explained that occasionally doesn’t mean 1-2 a day but 1-2 a week. I asked them to give kids fruit instead. I think they’re slowly understanding that we’re serious but there is definitely still room for improvement. You’ll get there. My memory with my grandmother (she lived with us also but in her own area) was her always having a biscuit jar in her sideboard. We would visit and the jar would come out. I think now, how wonderful it would have been if there were a jar of little toys, marbles or stickers as well. How magical that would have been. Libby, my favorite childhood memories were of spending time and not necessarily what we had to eat…can’t forget sitting on a river bank fishing with my grandfather or playing a simple card game with Grandma while she quietly talked and listened to me chatter…spending time and doing things together is one of the finest ways to show love. The diet is quite frankly ridiculous. Not sure how you’re going to force that on any kid. Carbs are not the problem, it’s the severe amount of added and unnecessary calories (sugar, and HFCS) in every food you feed your kids. I am not surprised that there’s a childhood obesity epidemic in the US, because not a single school will feed kids with this junk in my country. Unless, of course, they want to get a riot started by their parents, you know with torches and forks and stuff. Neither of these lunch boxes shown are extreme examples nor unusual. Eating real unprocessed food is not a diet and should not be seen as such. Yes sugar and HFCS are completely unnecessary and are affecting our children’s health which is why I don’t serve them and I don’t buy products that contain them. Kids in general are unlikely to do well on low carb plans. 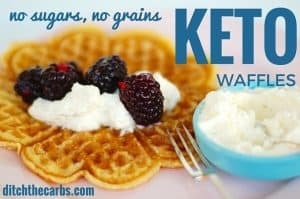 They don’t produce enough ketones to cover the brain’s glucose needs like adults do so the way I see it, the focus should be on removing the processed food rather than ditching the carbs. Potatoes, perhaps rice and other higher carb root vegetables are still nutritious for children. I keep on emphasising, we are low carb not no carb. 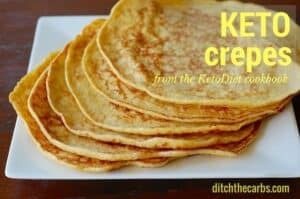 I don’t discuss the ketogenic diet in any shape of form here. Absolutely children can have higher carbs from nutrient dense carbohydrates (there are better sources of nutritious carbs than potatoes or rice) if they are healthy, fit, active and in the healthy weight range. My emphasis is on eating real food and removing processed food, not a ketogenic diet at all. Alam, where are you getting this info? That’s absolutely false. Alma is 100% correct. The brain needs glucose which it can get from healthy carbs. Just get rid of the over-processed foods with all that sugar. My one son cannot eat “low carb”- in a nutshell doesn’t metabolise fats well so he ends up actually starving. I feed him a high carb diet but with a focus on gluten free grains and higher carb fruits and veggies, like bananas, grapes, potatoes and dried fruits. 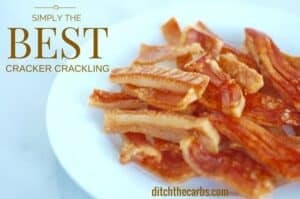 So it worth noting that some people metabolically function better high carb than low carb- even though it pains me to admit as I am an avid low carb follower and I have seen how beneficial it has been to my other two children and I. Have you consulted a pediatric gastroenterologist? Your child may need digestive enzymes. Celiac can go undiagnosed if the pt doesn’t have “traditional” symptoms — incl. neuropsychiatric (i.e. behavior and cognitive issues).